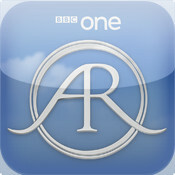 Antiques Roadshow – There’s An App For That! We know that there is a significant overlap in the fan-base of listeners to Project Moonbase and viewers of that stalwart of Sunday evening television, Antiques Roadshow. Well, good news reaches us here at the Moonbase of a new iPhone app (free!) which enables you to play along with the show, seeing if you can guess the value of each piece as it comes up. This entry was posted in announcement and tagged antiques roadshow, app, ios. Bookmark the permalink.